The Guinea Worm Dracunculus medinensis (the fiery worm of Medina) is a nematode parasite whose female can reach up to 800 mm in length, holding the record for the longest human parasite. Female worms cause Guinea Worm disease, or dracunculiasis, a disease characterized by fever, dizziness, vomiting, and intense burning pain due to the migration of the worm. The worm travels down on the leg and to the skin, where it forms blisters and then painful ulcers, through which the worm can protrude. Symptoms lead to lost productivity and increased school absenteism in affected communities. The Guinea Worm has a complicated life cycle. The burning sensation of the ulcers causes the host to immerse their extremity with the worm into water, where the female releases hundreds of first stage larvae. These larvae are eaten but not digested by aquatic invertebrates called copepods, in which the larvae molts twice. 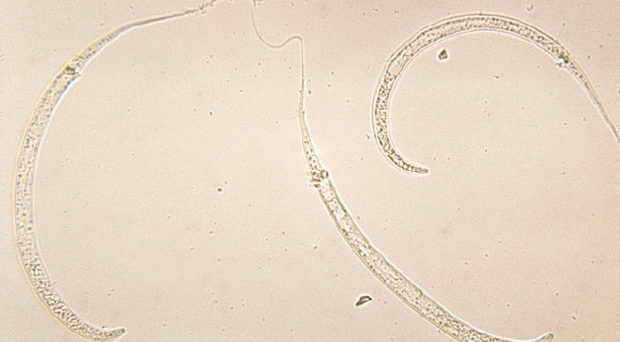 These third stage larvae can infect hosts if ingested. Guinea Worm disease is a historical disease, referred to even in the Bible, and it has been found in Egyptian mummies. Even as recently as 1986, there have been an estimated 3.5 million cases of Guinea worm disease in 20 endemic countries in Asia and Africa. At that time, the WHO asked the US CDC to spearhead an effort to eradicate the Guinea Worm. The Carter Center, the non-profit organization established by former President Jimmy Carter took leadership of the project, integrating WHO, CDC, and UNICEF. By 2004, the Guinea Worm was eradicated from Asia. In 2008, the Bill and Melinda Gates Foundation and the United Kingdom Department of International Development provided further financial support towards eradicating the disease. In 2012, the London Declaration for Neglected Tropical Diseases reaffirmed the commitment to eradicate the disease by 2020. During this period, the number of cases reported has been reduced by 99.999% to 19 cases reported so far in 2018, only in Angola, Chad, Ethiopia, Mali and South Sudan. However, getting from these few cases to true eradication poses a number of difficulties. One of the complications is the recent discovery of Guinea worms in non-human hosts. There has been sporadic reports of Dracunculus medinensis in dogs before, but since 2014, the Guinea worm has been found in domestic dogs and cats as well as some baboons in Chad and also Ethiopia. Chad has also reported an increase in new cases in the last decade. This can pose a serious problem if the Guinea worm finds an alternative host in dogs, and especially in wildlife, because of the difficulty of treating and preventing infection in them. Current human cases seem to be spill-over infections from the worms associated with these dog populations. One potential source of infection for dogs is their diet – local fishermen feed them with the guts of fish collected in local ponds, which are contaminated by infected copepods. Another source could be frogs that also have been found to be infected by Guinea worms, which dogs also eat. However, it was unclear whether the Guinea worms found in dogs are a distinct species or population, or the same that infects people. Elizabeth Thiele at Vassar College and her coauthors at CDC, the Carter Center, and the Wellcome Sanger Institute answered these questions by comparing the genetics of 128 Guinea worms extracted across Chad, Ethiopia, Mali and South Sudan from both human and non-human hosts. After DNA extraction, they investigated the mitochondrial variation by sequencing four mitochondrial genes. Since adult female worms already contain larvae, they had to account for genomic variation by deriving a putative maternal genotype for each extraction. They estimated microsatellite gene diversity of the parasite population, and used those to investigate the genetic differentitation and structure of Guinea worms from different countries and hosts, and estimated their population size. The most genetic diversity was found in Guinea worms from Chad, even after correcting for different sample sizes from different countries. They did not find a differentiation of haplotypes in terms of which host they would be found in. However, they did find some level of differentiation in terms of geographic location. The estimated population size of the worms was in the 10,000-60,000 range, with a decline in population size suggested in the last 600 years. All the evidence they collected suggest that the worms found in humans and dogs in Chad and elsewhere are the same species, and that no specific adaptation is occuring for the different hosts. The large population size indicates that the lack of reporting in Chad in the prior decade was more likely due to insufficient surveillance than due to a lack of presence. The authors remark that while the presence of Guinea worms in non-human hosts seems recent, it has been demonstrated previously. These results imply that eradication will require the elimination of Guinea worm transmission both in people and in non-human hosts in this area. Educational campaigns have already started to pursuade local fishermen to not feed contimated fish guts to their dogs, and to keep dogs away from water sources. Hopefully, with the success of these efforts, the Guinea worm can truly become a scary story of the past. Would there be any way that I could get access to the article that this post was written on?